Several years ago, before creating this blog, I had a wonderful dream. I saw two angels at dusk walking at the edge of a field bordered by tall trees. Although they were a good distance away, I could feel the rush of their holy presence on the other side of the field. It was the same wonderment one gets when seeing snow for the very first time. Hurrying towards them, I called out. They were dressed in white and somehow lighted. I thought perhaps they were carrying candles, but it was the glow of their light that helped me see them. By the time I got to where they were, they had disappeared. I awakened hearing a familiar angel tune that I hadn't heard in quite a long while. Curious, the next morning, I went to get the songbook. 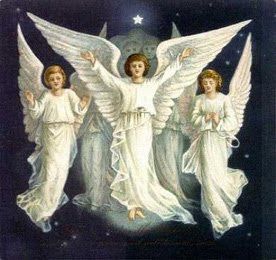 To my surprise, it was opened to Adoration to the Angels. The song I heard in my dream! Majestic, triumphant, bring in the new day." This precious dream and the synchronicity that followed were a gift that strengthened my faith in the unseen help that is available to us all.